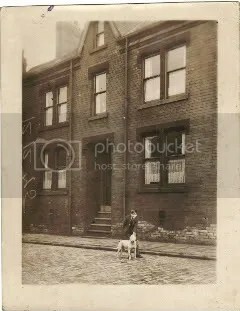 Dad and bull terrier, 1930s. Well I suppose a shaggy dog story was inevitable, at some point, for me! This one happened to William Nattriss, farmer. He married Ann Guy who was an ancestor of both of my parents, by some bizarre quirk of fate. ‘Bizarre’ given the fact my dad was from Leeds and my mum from Ryther. I’ll save Ann ‘s story til a later date as it’s a ripping yarn involving a scheming stepfather, and a disastrous second marriage to a bigamous Huddersfield policeman. That’s worth a blog entry on its own. Annie went from being the privileged, privately educated daughter of a wealthy yeoman farmer, in the attractive East Riding – to living in a condemned slum in grim Huddersfield. All very Barbara Taylor Bradford. William Nattriss was Annie’s first husband; a farmer, from a similar background to her own. They had four children; Robert Guy Nattriss born 1858, Jane Annie born 1861, Thomas Nathaniel born 1864 and William Frederick born 1866. Only the oldest and youngest son survived infancy. And only Robert Guy Nattriss appears to have made it into adulthood. He turned up in the 1891 Census living in lodgings near Paragon Docks, Hull, working as a ‘fisherman’. He gives his birthplace as York and he was unmarried, which he remained. So this branch of the family tree died out with Robert. His father, William, the subject of this story died in 1870 aged only 32. The farm had been mortgaged, then sold. Annie was left with £400. She left Kelfield in 1870, to make a new start in Huddersfield. What happened next – I’ll tell you about some other time. Like her mother before her, Annie seems to have been a con-man magnet. This story comes from 1861. Annie and William were 23, had two year old Robert Guy and a second baby on the way. This action was brought for the recovery of a dog, which it was alleged had been illegally detained by the defendant, who is a mess-master at the Barracks. The plaintiff resides at Kelfield, and is a farmer, and he, along with several other witnesses, described a dog which he had lost named “Charley”. The defendant contended his dog was named “Sam”; that he had bought him off a man named Burton, who is the Leeds guard, for 15s., and that he was doubtful about the identification by those opposed to him. The dog was let loose in Court, when evidently “Sam” and “Charley” were synonymous to him, as he answered to each call. Verdict for plaintiff. "Charley"'s descendant in the family: Charmy. She's 10.